Wanderlust: A Global Odyssey by Matt Prater: 3 … 2 … 1 … Bungee! 3 … 2 … 1 … Bungee! Saturday, we traveled seven hours to Victoria Falls on the Zambezi River in the northwest corner of Zimbabwe. One of the seven natural wonders of the world and the single largest sheet of falling water on Earth, Victoria Falls thunders through a gorge that separates Zimbabwe and Zambia. In the local language of Ndebele, it is known as Mosi-oa-tunya, "the smoke that thunders." Being the wet season, the water in the Zambezi is too high for rafting, but the falls themselves are spectacular – flowing at maximum capacity, 800,000 gallons of water per second plunge over a mile wide, 400 foot cliff into the maelstrom of the river below, making Victoria Falls the largest waterfall on Earth by volume of water. The spray from the falls rises 1,300 feet into the air and can be seen from up to thirty miles away. Known colloquially as Vic Falls, the area is one of the great adrenaline capitals of the world, and I certainly got plenty of thrills during our four nights here. The town of Victoria Falls was built with tourism in mind. The walkable streets are lined with expensive shops and a couple of luxury hotels. The Zimbabwe side of the falls used to be the main tourist destination, but tourism has shifted over to Livingstone on the Zambian side as travelers in the last decade or so have been hesitant to venture into Zimbabwe. Political violence, economic instability, and general negative press have scared tourists away, but very recently, they have begun to slowly return to the damaged country. Converting to the U.S. dollar has been helpful in stabilizing the economy, but it has also made things quite expensive – sometimes even more expensive than in the States itself. 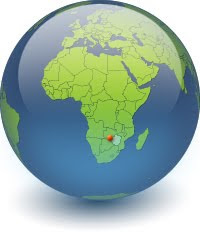 Zimbabwe has also become an import rather than export economy, and this further increases prices. Yesterday, Easter Sunday, has been much anticipated for most of the trip – it was bungee day! I woke up almost shaking from nervousness, ate a light breakfast, and walked towards the gorge with my friends who were also jumping. 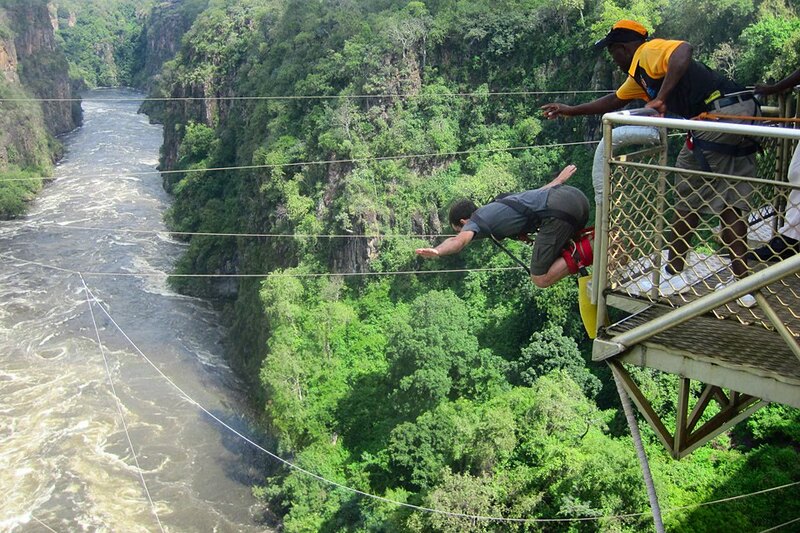 The bungee jump at Vic Falls is located on a bridge that spans the Zambezi River and connects Zimbabwe and Zambia, so the bridge is technically in no man's land. For people only going to the bridge and not to Zambia, the border post hands out slips of paper instead of officially stamping exit stamps in passports. As we walked onto the bridge, I dizzily peered down at the raging river 365 feet below – this is one of the highest commercial bungee jumps in the world. A man sets up a high wire activity in Batoka Gorge on the border of Zimbabwe and Zambia. The Victoria Falls Bridge can be seen in the background. We walked across the bridge to a building perched on the Zambian side of the gorge. We signed in for the jump and were weighed, and then we walked back to the center of the bridge where we watched people bungee while we waited to be fitted in our harnesses. The more people we watched, the more nervous we all became. By the time it was my turn to walk over to the platform, I was in such an adrenaline-fueled haze that I don't really remember those last minutes before the jump. The guys on the platform tied my feet together with padding, attached the harness, and adjusted the bungee cord for my weight. They helped me hop over to the very edge of the platform, my bare toes hanging over the edge. The thunderous roaring of the nearby falls was all I could hear, and water spray fell on my face. As instructed, I bent my knees, spread my arms into the air, and prepared to dive. One of the guys yelled, "3 … 2 … 1 … bungee!" The next few minutes were a blur. Suddenly I was plummeting head first at extreme speed towards the raging rapids far below. 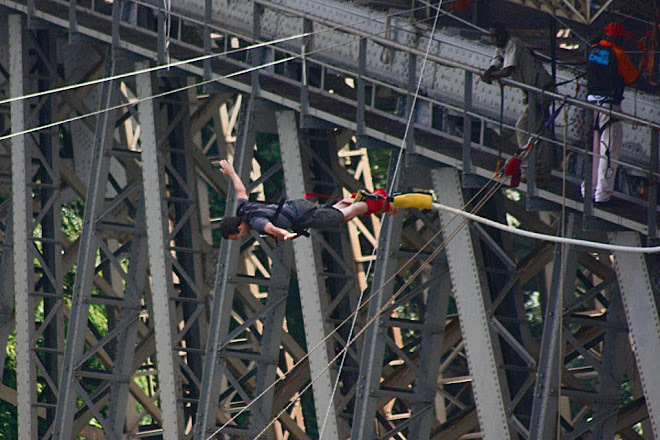 After only seconds, the bungee stretched, and I abruptly bounced back into the air almost to the iron arch of the bridge. I looked up and saw people far above leaning over the railing to look down at me. I tried to wave at them, then fell again, upside down and twirling uncontrollably like a helicopter. Blood rushed to my head, and I tried to regain my bearings as the river spun around and around below me. To one side, a guy in a harness was moving up and down as I continued to bounce. When we finally equalized, I grabbed his hand, and he hooked my harness to his rope. Finally upright, we slowly ascended towards the bridge, and I clambered onto the metal grating of a catwalk spanning below its massive arch. Thankful to have something solid under my feet, I walked barefoot along the catwalk and finally reached the stairs to the main level of the bridge. "Never again," I swore as I returned to my friends standing in the middle of the bridge. The bad part was not the fall itself, but the excruciatingly uncomfortable feeling of twirling upside down and waiting for someone to hoist me back to solid ground. I was queasy from the endless twirling, and I had a headache from hanging upside down for so long. However, I do not regret bungee jumping – I will always cherish the experience, and I think that it will allow me to be more courageous about trying extreme activities in the future. After free-falling head first into a 365-foot-deep gorge, I think I deserved to relax the rest of the day. In the late afternoon, some friends joined me for high tea at the historic Victoria Falls Hotel, situated on the edge of the gorge with a majestic view of the bridge. We binged on finger sandwiches, scones, and cakes that were elegantly displayed on triple-tiered trays. After tea, we took pictures with the wild warthogs that had wandered onto the grounds. Victoria Falls is situated within a national park, so it is not unusual to spot wildlife in the town. After such an action-packed morning and relaxing evening, I certainly slept well. Today was another adventure: I had booked a full-day adrenaline package. Rested from my bungee jump yesterday, I set out towards a U-shaped section of the gorge with Nix, her parents, and a few others. There were five activities available, and my package allowed me to do them an unlimited number of times. First up was the Flying Fox, a horizontal line stretching 650 feet across the gorge. I was fitted into my harness, which I would wear most of the day. I walked over to the platform – basically a diving board jutting out over the cliff. After being hooked into the rope, I ran at full speed towards the edge of the cliff and leaped off, arms outstretched as if I was flying. I zoomed out over the gorge, high above the rapids. I made it about halfway to the other side before I started slowing down. I then hung over the river and enjoyed the view while I was reeled back in. 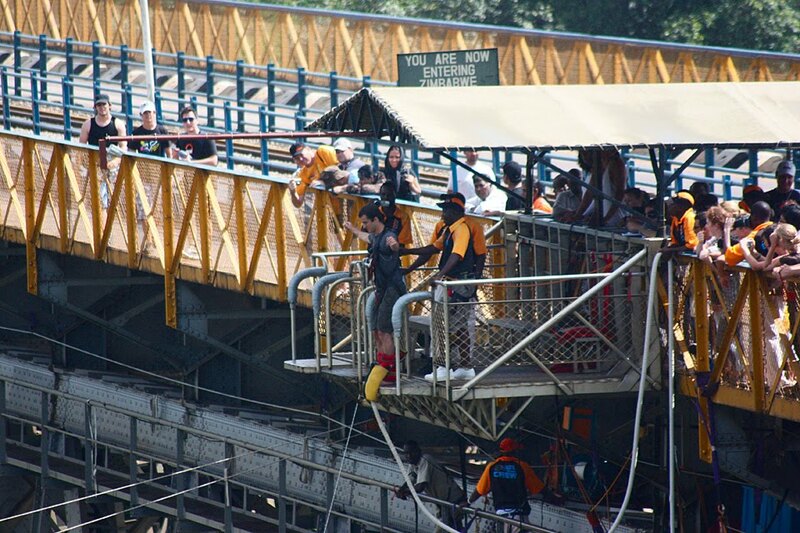 The Flying Fox really wasn't scary at all, at least after the bungee jump, so I decided to do it again. This time I held my small video camera the whole time for a unique perspective. The next activity was the zip line, which stretches at a steep angle 1,500 feet to the other side of the gorge. Standing on the platform at the edge of the cliff, it looked terrifying, but after I jumped it was pure excitement as I raced at 60 miles per hour down the line towards the river. Once at the bottom, I had to wait for a guy to come down and reel me back up to the top of the cliff. Like the Flying Fox, I decided to do the zip line a second time while holding my video camera. Nix joined me in a tandem ride, and with two of us, our extra weight allowed us to go a bit faster. 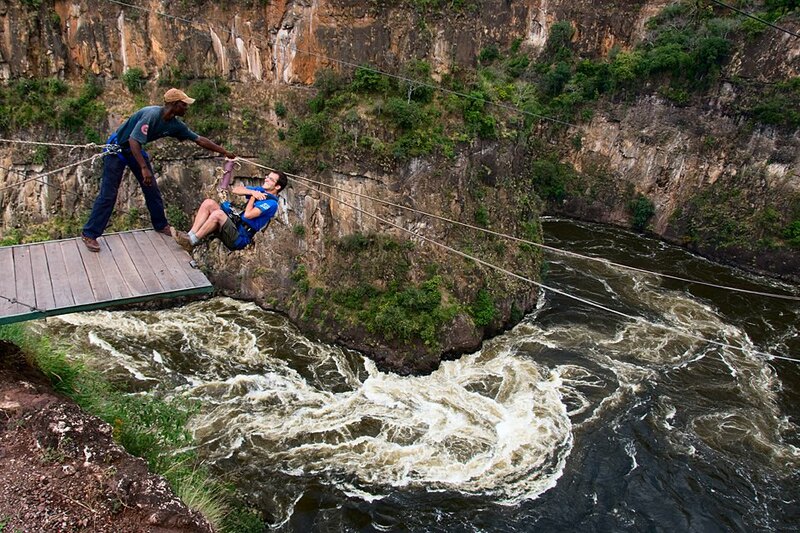 The third activity was the infamous gorge swing. Standing at the edge of the 400-foot cliff, I jumped off and fell for 230 feet along the face of the vertical cliff. Then I pulled away from the cliff in a gigantic pendulum swing that carried me over 300 feet out over the rapids. It was terrifying and exhilarating, and it was much better than the bungee jump. Like with the other activities, I went a second time. This time I faced with my back towards the edge of the cliff and leaned backwards, falling upside down along the cliff and then flipping upright once I began the swing. By this point, I was getting used to jumping off cliffs, and it was pure fun. Next we hiked to the other side of the gorge, where we would abseil (rappel) down a 150-foot cliff. My harness was all hooked up, I leaned backwards over the cliff, and hand over hand made my way slowly to the bottom. I've abseiled before (in high school), but never in such a spectacular setting or down such a high cliff. Once I reached the bottom, I had quite a grueling hike back up the top of the cliff that involved balancing on rickety ladders constructed of tree branches. The last activity was new to me – it was a rap jump, which is a forward-facing abseil. Instead of facing the cliff while walking down, I leaned forwards over the cliff and slowly walked down, staring at the terrifying height the entire time. To speed the descent, I hopped away from the cliff periodically and let the rope out to cover more distance. It seemed against gravity to walk down a cliff this way, but it was a unique experience. After a few hours to relax, our whole group went out for dinner at The Boma, a game restaurant. There was an all-you-can-eat buffet where the meat was cooked in front of you. I had a plate piled absolutely full with all types of meat: African buffalo, impala, kudu, warthog, and ostrich. I also ate a mopani worm, a traditional delicacy in Zimbabwe. Warthog and kudu were definitely the best meats, and both were easily better than any pork or steak I've ever had. After dinner, we were treated to traditional African drumming and dancing, and then drums were handed out to everyone in the entire restaurant for an interactive drumming session. Between the quality and variety of the food, the atmosphere and music, and the fact that it was the goodbye meal for some of my friends who were ending their trip in Vic Falls, it was one of the best meals of my life.